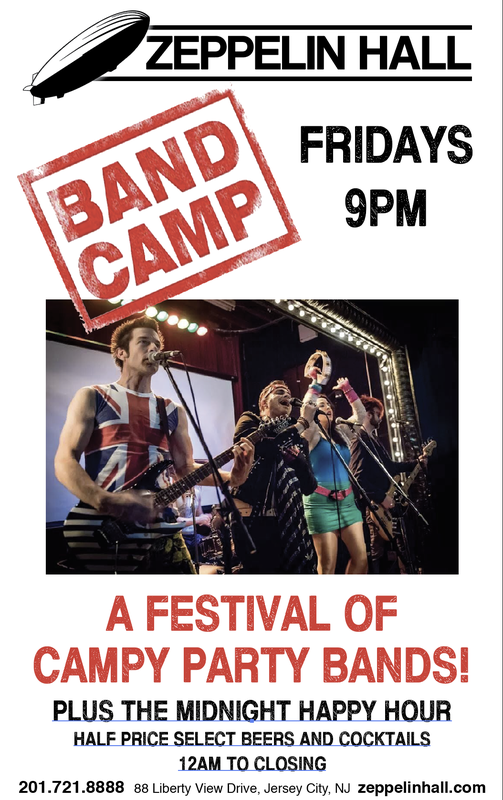 Baconfest is back! 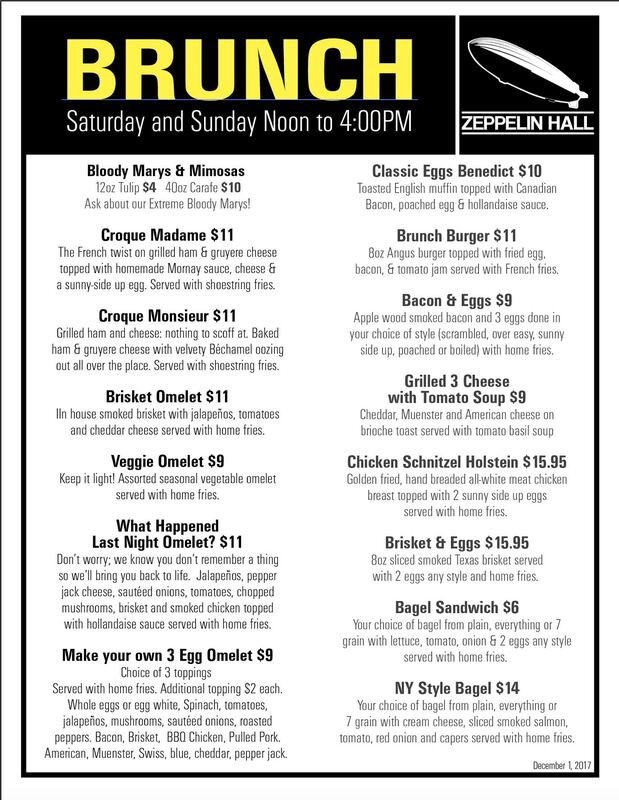 Zeppelin Hall, Jersey City’s renowned biergarten, is serving up a bacon lovers’ menu that is incomparable. 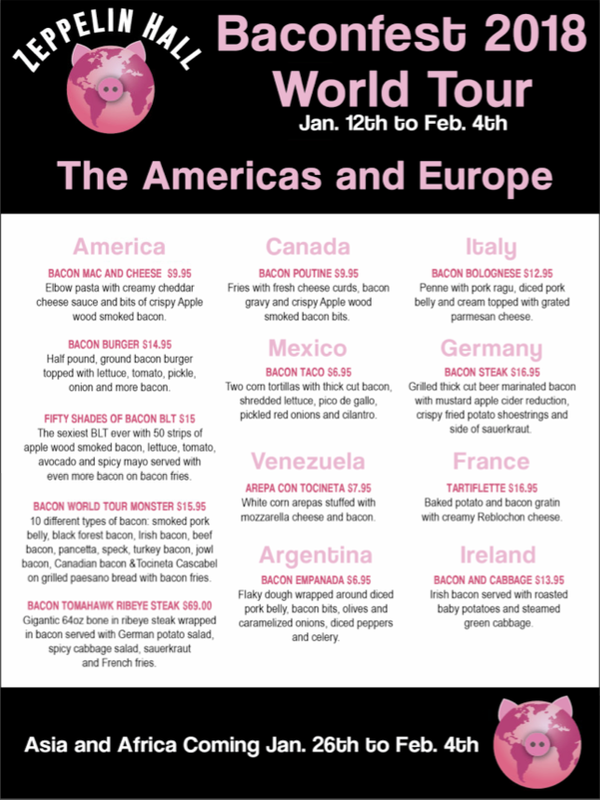 This year’s global theme, Baconfest World Tour, presents delicious, unique dishes through February 4. People’s love of bacon is nothing new. The Chinese started cooking salted pork bellies more than 3,000 years ago. And the average American who eats meat is known to consume 18 pounds of bacon a year. Bacon mania is on the rise, with the sales of bacon products increasing over the past seven years. Executive Chef Franco Robazetti has created tempting menu items for Zeppelin Hall’s Baconfest with global inspirations. They include cuisine that represents the Americas, Europe, Africa, Asia, the Middle East, and more. We stopped by on a Friday night for dinner and had the opportunity chat with Chef Franco. He told us that he enjoyed being inventive with the use of bacon while still keeping the dishes authentic to the regions they represent. Share-friendly items include the perfectly prepared, Argentinian-inspired bacon empanadas, with a flaky dough wrapped around diced pork belly, bacon bits, olives, caramelized onions, diced peppers, and celery. Arepa con tocineta has a Venezuelan influence with white corn arepas stuffed with mozzarella cheese and bacon, while francophiles will enjoy the taste of traditional French tartiflette made with baked potato and bacon gratin with a creamy Reblochon cheese and served with toast points. The menu includes a few pasta plates, like the signature American dish, bacon mac and cheese made with elbow pasta, creamy cheddar cheese sauce, and tasty bits of crispy applewood smoked bacon. We savored one of our favorites, done to perfection. The bacon bolognese will certainly please Italian food aficionados. The al dente penne pasta is served with thick pork ragu and diced pork belly in a rich tomato sauce topped with grated parmesean cheese. If you like Thai food, consider ordering bacon pad Thai with stir-fried veggies, peanuts, pork belly, and cilantro. 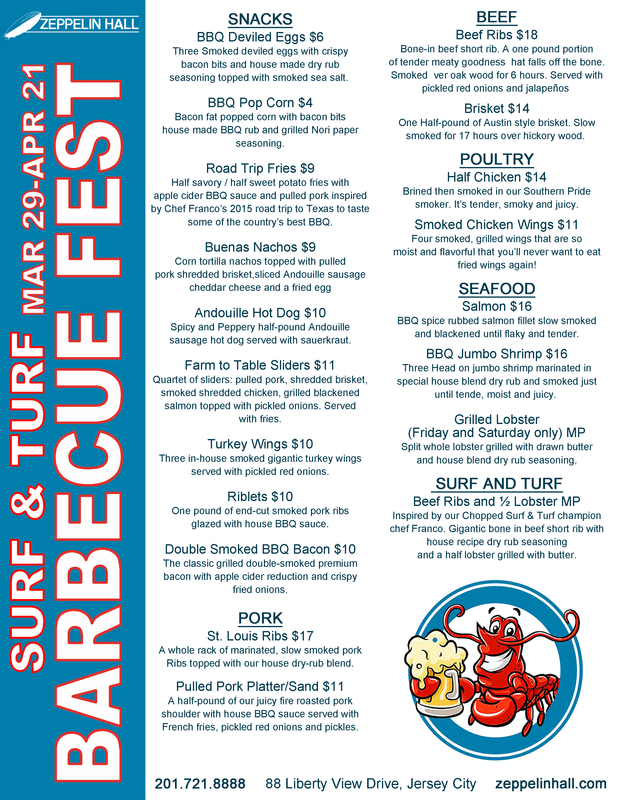 And there’s even an Australian dish—shrimp on the barbie—with bacon-wrapped shrimp served with fries. Shown below: Bacon pad Thai, bacon bolognese, and bacon mac and cheese. Those who make Zeppelin Hall’s Baconfest an annual event will be pleased to know that the menu still includes time-honored classics such as the 50 Shades of Bacon sandwich, Ten Bacon World Tour sandwich, and the bacon-wrapped Tomahawk steak. Pairing drinks with your bacon-licious meal is easy. 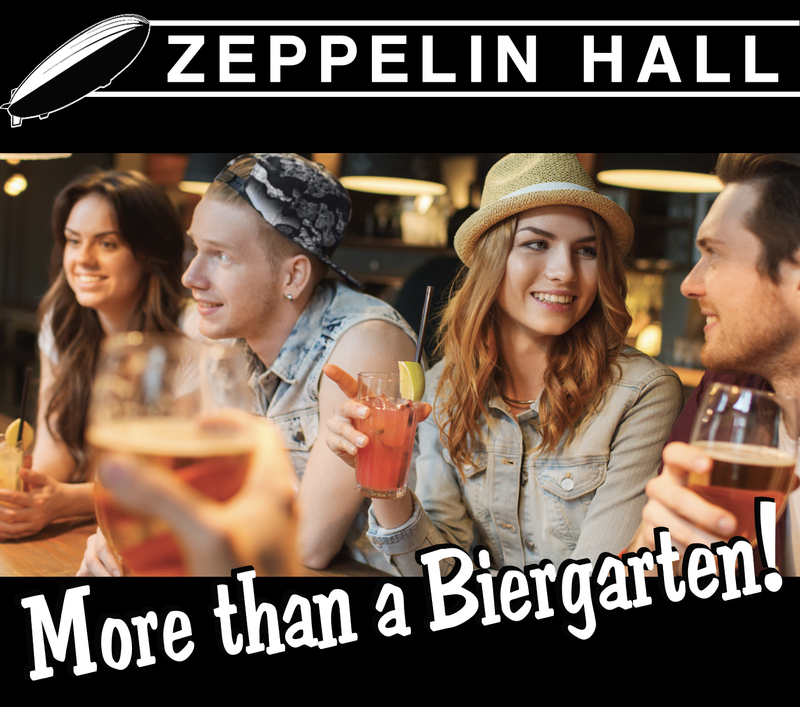 In addition to over 100 beers on tap, Zeppelin Hall has wines, liquors, and cocktails. 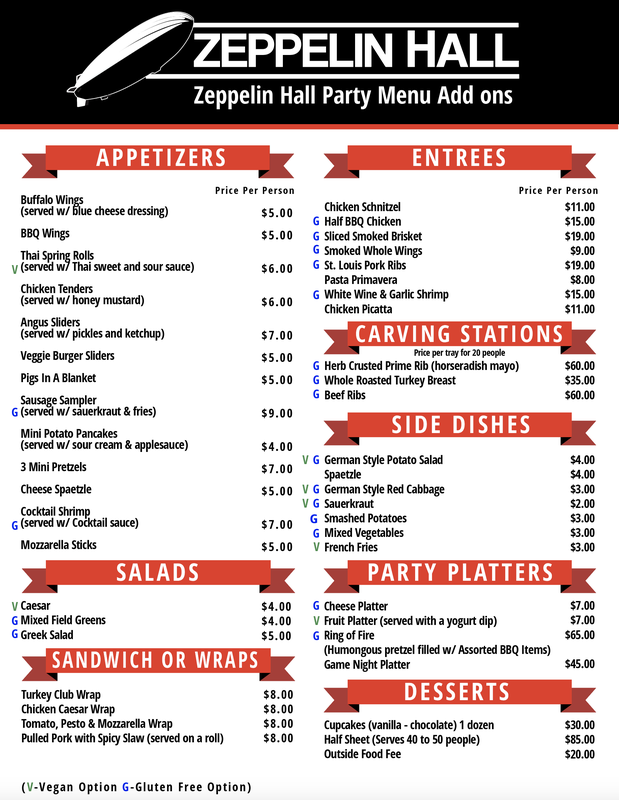 Zeppelin Hall now offers full table service in the front dining room, which gives guests a relaxing option for their dining experience. As always, the walkup window is in full swing and you can gather with friends and family at the 30-foot communal tables. The spacious bars are also very accommodating for guests who stop by for a drink. Ample free parking is available. The restaurant is located one block from the Jersey Avenue Light Rail Station and five blocks from the Grove Street Path Station, and can accommodate groups from 20 to several hundred people. 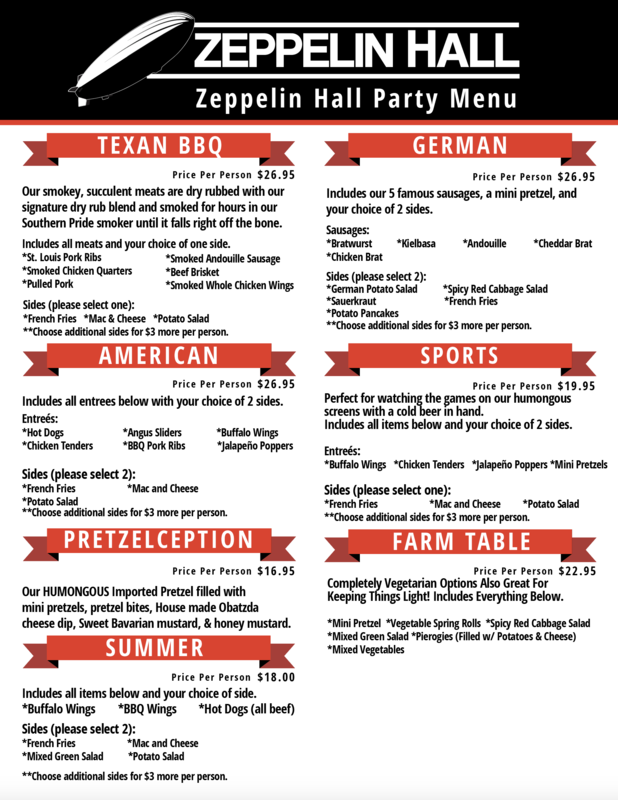 For more information about Zeppelin Hall, visit them online or call 201-721-8888. 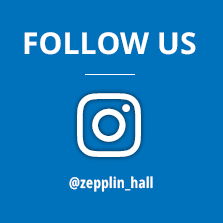 Follow Zeppelin Hall on Facebook and Instagram. Photos courtesy of Zeppelin Hall.